Product prices and availability are accurate as of 2019-04-11 22:07:28 EDT and are subject to change. Any price and availability information displayed on http://www.amazon.com/ at the time of purchase will apply to the purchase of this product. Petastic Ecos Pet Laundry Detergent is the purest, greenest, most effective 100% natural detergent for pet clothes. 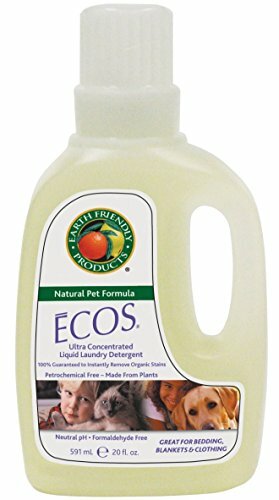 It contains a unique formula specifically designed to clean and deodorize pet bedding, toys, clothes and towels. 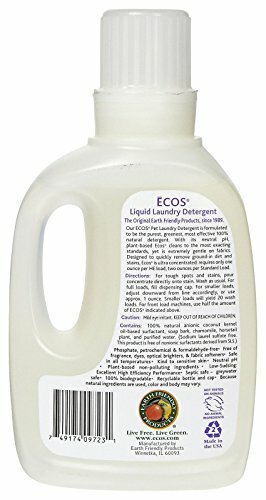 This detergent is ideal for you and your pets with skin sensitivities as it's free of essential oils, fabric softeners and optical brighteners. It's required in lower quantities -- only one ounce per HE load and two ounces per standard load. A Closer Look: Petastic Ecos Pet Laundry Detergent maintains a hair-free home. Keep in the car or garage for quick clean-up of your car's interior, car seats and floors. It's made from purified water, 100% natural anionic coconut kernel oil-based surfactant, salt, almond and cherry oil.